We’ve done pizza, we’ve done Philly cheesesteaks, and now it is our pleasure after much research to share with you the top burgers in Jax. A lot of times when you see online lists of the best [fill-in-the-blank] in Jax it’s assembled and written by someone who is simply sharing their personal favorites based on wherever they eat out regularly or the writer simply makes a best of list from memory or we’ve even seen lists where a writer from outside of Jax has very obviously used Yelp reviews to make the list. The internet is great, but is no substitute for taste buds. Personal favorites are fine, but not fair to the hardworking chefs making great food in parts of the city you’ve never visited. We consider ourselves resident experts on the Jax food scene, but are not so conceited as to assume we have all the answers and knowledge without putting in the research. Research meaning eating. Lots and lots of eating. 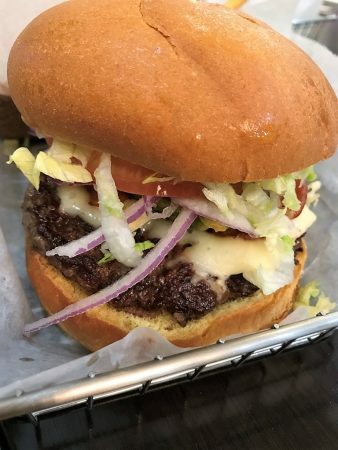 In order to create a list of the best burgers in Jax we asked your input on our Facebook and Instagram pages. We then built a list of the relevant burger places in Jax. Then we drove the entire city and tried over 25 top rated and highly recommended burgers in order to narrow down the very best. It bears mentioning that the margin between #5 and #1 is razor thin. But this is how the cookie crumbled the day we ate an ungodly amount of burgers to find the best in Jax. Poe’s: Going into this burger adventure if you asked me if Poe’s was likely to make this list I’d have told you that it was a shoe-in. There’s no doubt it is the beaches favorite burger spot. Unfortunately, when we visited Poe’s to try the burger and compare it to the other top burgers in town it just didn’t stand up to the competition. I’m pretty sure we caught them on a bad day but if we’re sending you some place telling you it’s one of the best burgers in town it really should be one of the best on just about any day you visit. With that said I have a feeling they’ll be a favorite to make next year’s top burger list. 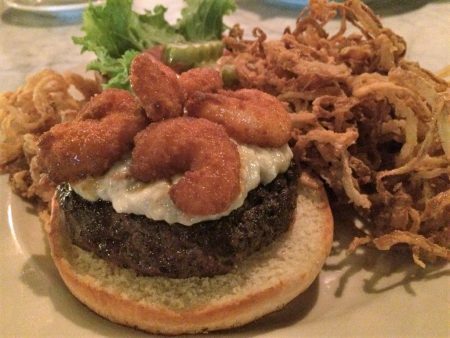 M Shack: M Shack is one of Jacksonville’s most popular burger spots helmed by Jacksonville’s most successful sibling chefs. They served grass fed beef patties with plenty of flavor and have a wide variety of options for gourmet burgers that are wonderful. They came very close to making the top 7 but ultimately fell just short. If you have a burger at M Shack you’ll be glad you did. #5 German Schnitzel Haus: Their modern German Cuisine is top notch. Their new vegan options are without question some of the best food in Jax. Since there are a lot of reasons to head over to German Schnitzel Haus sometimes I think their burgers get lost in the mix. Their burgers are darn good! Whether you indulge in the Berlin Burger with with their ground chuck, short rib and brisket patty with gruyere and beer cheese on a house made pretzel bun or the French Onion Burger topped with caramelized onions, spicy mustard, balsamic glaze and a cheese crisp on a snowflake bun also made in haus you be in artery clogging heaven. Also, if you’ve got vegan friends take them along for the impossible burger which this meat eater can attest really tastes like meat! #4 Pine Grove Deli and Market: You’ll know you’ve arrived at the right place when you pull up out front and see the truck with the giant steer horns on the front owned by one of the family members behind Pine Grove Deli and Market. Originally a simple butcher shop, Pine Grove has morphed into butcher shop/burger joint/restaurant. You can still grab amazing cuts of meat that will delight even the most discerning connoisseur of steak but now there’s so much more now. Long time Avondale and Westside residents have been coming here for years and will tell you Jacksonville’s biggest open secret is that some of the best burgers in town can be found at Pine Grove. When we sampled the burger here we loved that it still had that tinge of grill taste that so many burgers lack. #3 Cackylacky: Jax’s burger scene has grown dramatically and we’d be remiss if we didn’t include the burger truck everyone’s talking about in this list. 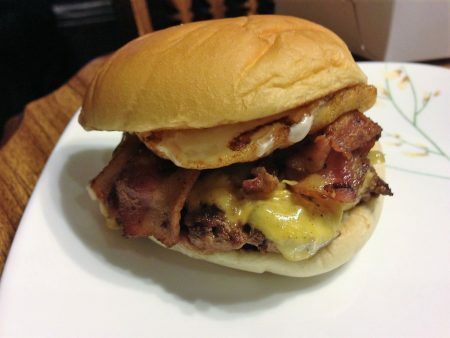 Cacklacky is a small food truck serving up burgers that will make your mouth water. Their burger is just the right amount of juicy and the meaty flavor shines through in each bite. If you love guacamole on your burger make sure to order the Outerbanks: 6oz fresh angus patty, roasted poblano mayo, bacon, lettuce tomat, cajun ranch, and a key lime guacamole atop a toasted local brioche bun. The key lime guac is to die for! #2 Picasso’s: Located in Mandarin Picasso’s is perhaps the biggest surprise of all on this list. 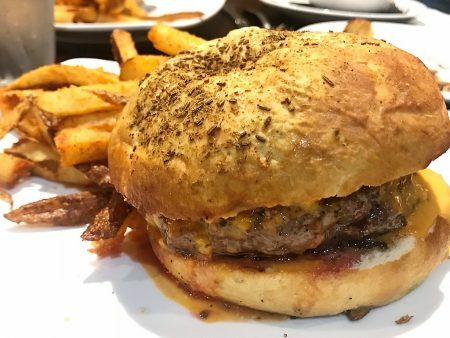 How does a place specializing in pizza and Italian food make the list of the Top Places to get a Burger in Jacksonville? Perhaps it’s the same way they’d near the top of our lists for ramen, rissotto, pizza, philly cheesesteaks and most of the things they offer. This sleepy little Mandarin favorite just oozes passion and love for food in everything they make. The burger we indulged in at Picasso’s was two patties covered in a magical liquid cheese sauce we could likely drink. This burger has a way of simply melting in your mouth. It’s different in flavor and texture than every other burger on our list and when we can stand to look at another burger we’ll be back to eat it again and again(Trying 25 burgers in 7 hours takes a lot out of you!). #1 Epik Burger: We assumed going in that Epik Burger would make this list. As this is our 5th time creating a Top list for a particular style of food we’ve found that when you try the same food from restaurants all over town one after another you really get a chance to compare and figure out if your preconceived notions about how everything stacks up bear out to be true. For us what makes Epik Burger top this list is quality, variety, execution and consistency. Not to mention the fruit and cheese burger we were served on the trek around the city for this list blew us away! Epik burger really has it all. If you just want a bacon cheeseburger the one they serve you will be killer. If you want something totally different that have that and you won’t be disappointed. Want seriously amazing top tier cheese on your burger? Try the Old Quebec vintage super sharp cheddar. The cherry on top is that in the age of escalating burger prices every burger on Epik Burger’s menu is still under $10. How’s that for awesome! Tagged Alcohol Serving, american, Beer (Breweries and Restaurants), burgers, Casual, Dinner, kid friendly, lunch, Serves Alcohol, Takeout Available. Bookmark the permalink. You left off the French Pantry burger!